The stakes are high, the chips exchange hands, and dreams crash as quickly as the cards are revealed: itâ€™s got to be Texas Hold â€˜Em. This weekâ€™s movie recommendation is John Dahlâ€™s film about the underground world of professional poker players, known as Rounders (1998). The story begins with Mike, played by Matt Damon, collecting together all of his secret stashes of cash to play a game of high-stakes poker. His opponent is Teddy KGB, a â€˜connectedâ€™ guy played by John Malkovich, who possesses a comically unplaceable (perhaps Russian?) accent, a good eye for cards, and a peculiar love of Oreos. Teddy cleans Mike out for the $30k that was intended to fund Mike’s daytime occupation of a law school education. Lesson learned, Mike retires from poker and directs himself to honest work to fund his degree. Before long, Mikeâ€™s childhood buddy Worm, played by Edward Norton, is released from prison. Worm has perfected his card hustle while inside: he would win money from inmates, that he would then strategically lose to the guards. This way, upon his release from prison, heâ€™d have both a network of available games to play at the courtesy of his correctional officer friends, and a well-established reputation as an atrocious poker player. The situation is ripe for the hustle. However, some long-standing debts that Worm accrued before his sentence began have been carrying interest during his incarceration, and he needs Mikeâ€™s help to scrounge the cash together before his creditor Teddy KGB comes a-calling. The clock is ticking. Damon at this point in his career was still enjoying the acclaim heaped upon him for playing a disaffected kid with unusual potential in Good Will Hunting. The differences between that role and this one are slight. While both Will Hunting and Mike McDermott are immensely capable, Will lacks direction whereas Mike lacks self-control. And the latter is far more difficult to sympathize with, even if there isnâ€™t much else aside from the accent distinguishing the two roles â€“ heck, Damon didnâ€™t even go through the bother of getting rid of that irritating side-part. Mikeâ€™s relentless (and frankly exhaustingly over-worked) sense of loyalty to Worm makes him a far less interesting character than Worm, whose unscrupulous approach to card playing means he has few compunctions with adding debts to Mikeâ€™s tab and even forcing Mike to take vicarious responsibility for Wormâ€™s own indiscretions. Nortonâ€™s portrayal of the character Worm, who in turn is usually pretending to be some other character for the purposes of the hustle, is wonderful. Itâ€™s all there: the sweaty palms from the immensity of the stakes in play, the glint in the eye when the con works, and the droopy-shouldered resignation when it doesnâ€™t. Characters deceptively playing other characters is familiar territory for Norton (e.g., The Score, Primal Fear —Â and dare I say The Incredible Hulk and Fight Club, albeit for different reasons? ), and the gimmick is well executed. 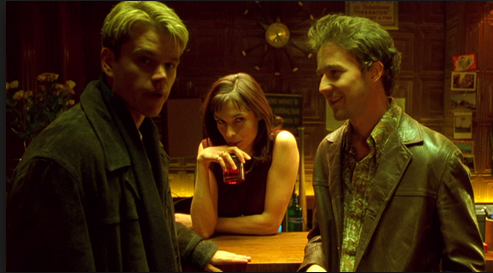 Once you get past Damon and Norton in the two lead roles, however, much of the supporting cast is risibly flat (especially so for the female characters): Famke Janssen plays Petra, the moll from one of the underground clubs with a talent for the game and an eye for Mike; Gretchen Mol plays Jo, who as Mikeâ€™s girlfriend and fellow law student has twice the reason to be disappointed when his gambling comes at the expense of their life together; Martin Landau plays Dean Petrovsky, the law professor who has taken to mentoring Mike and for whom a daft backstory is constructed to explain his preposterous generosity toward Mike; John Turturro plays Knish, the only Rounder with whom we eventually come to sympathize. The actingâ€™s not the problem, really â€“ itâ€™s just that theyâ€™re completely unbelievable as characters.